This is Yellowstone National Park in the US, famous as the world's first national park that conserves one of the world's few intact temperate zone ecosystems. This is a story of their interaction. In the 1800s, ranchers and farmers settled the western US, and they very quickly began trying to eliminate native predators -- wolves, cougars, bears, and coyotes, from their properties. Wolves normally prey on elk and deer, but since they don't know that certain animals are off-limits, they will also take livestock (usually sheep) that are allowed roam freely and unattended nearby. Even after Yellowstone National Park was established in 1872, people continued to wipe out predators inside, as well as around, the park. 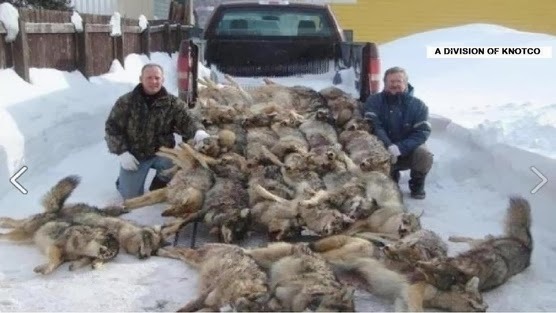 At that time, most people, including biologists, disliked how these big mean predators caught and ate harmless prey species and encouraged the killing, wiping out the entire wolf population in and around the park and across most of the country by the mid-1900s. 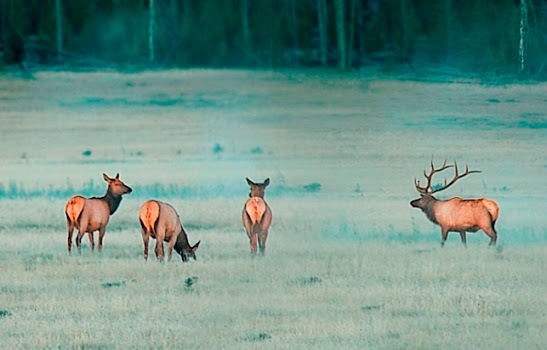 As the wolves disappeared, the elk and deer celebrated the lack of predators and multiplied, their oversized herds grazing more heavily than the vegetation could withstand. 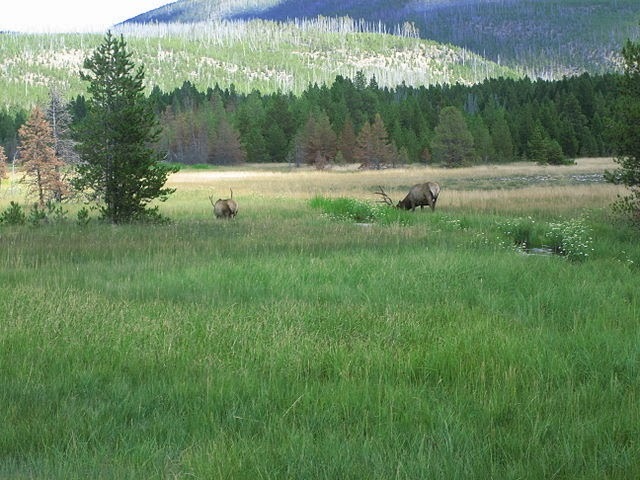 Inside Yellowstone, willows, cottonwoods, aspens, and other trees, especially the tasty ones along the banks of streams and rivers, were not regenerating because elk had eaten them so heavily. Without the vegetation, animals lost their hiding places, nesting places, and sources of fruit and other foods, and soil eroded into the streams. 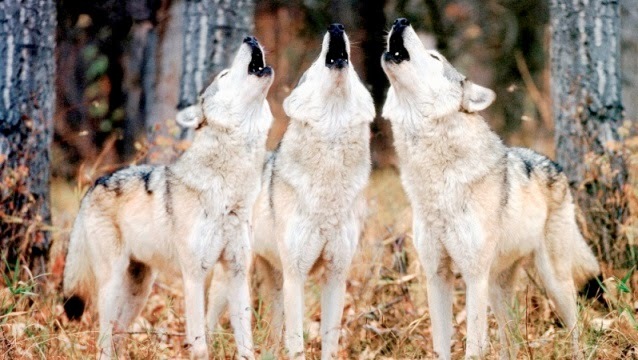 Wolves eventually "earned" endangered species status in 1967, and hunting became illegal a few years later. The effects of wolf hunting on both the wolf populations and the overgrazed the Yellowstone landscape were so noticeable that, when killing the now-overabundant elk wasn't enough, wolves were eventually reintroduced to the park on a trial basis, beginning in 1995. 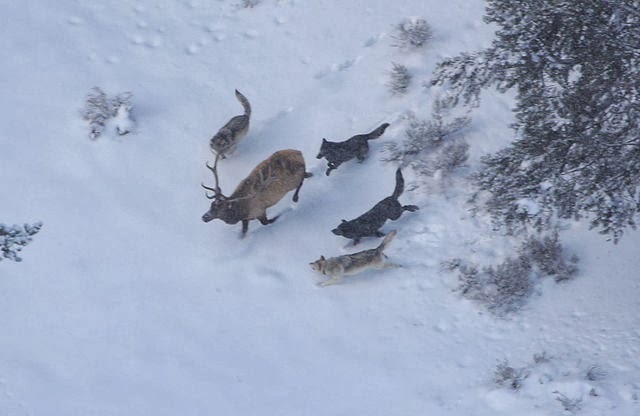 The reintroduction of a small number of wolves to Yellowstone National Park reduced the elk and deer herds somewhat, but more interesting was how elk and deer began avoiding more open areas where they might be caught by the newly present wolves. In fact, the wolves' renewed presence caused a series of ecological and physical effects across the whole landscape, which affected not only the ecosystem but also the geography of the park. Along with the puma (aka cougar or mountain lion), wolves are the top predator in the Rocky Mountain ecosystem. 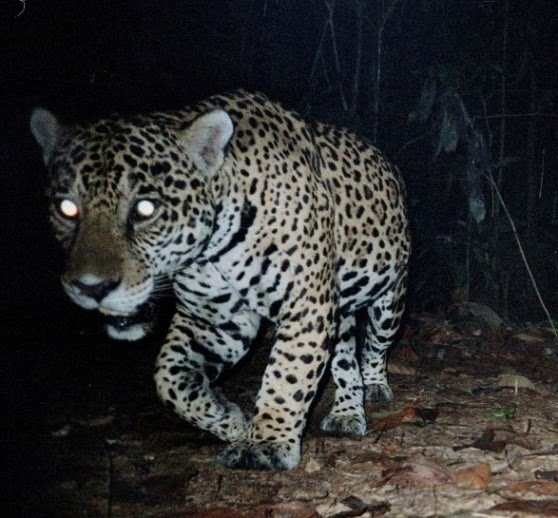 They and other top predators, play key roles in their respective ecosystems. The ecological role of wolves and pumas, as well as the tigers, otters, sharks, jaguars, bears, and eagles of the world, is one of keeping populations of big herbivores, like elk and deer, and mid-sized predators (called meso-predators), such as coyotes or raccoons, in check. 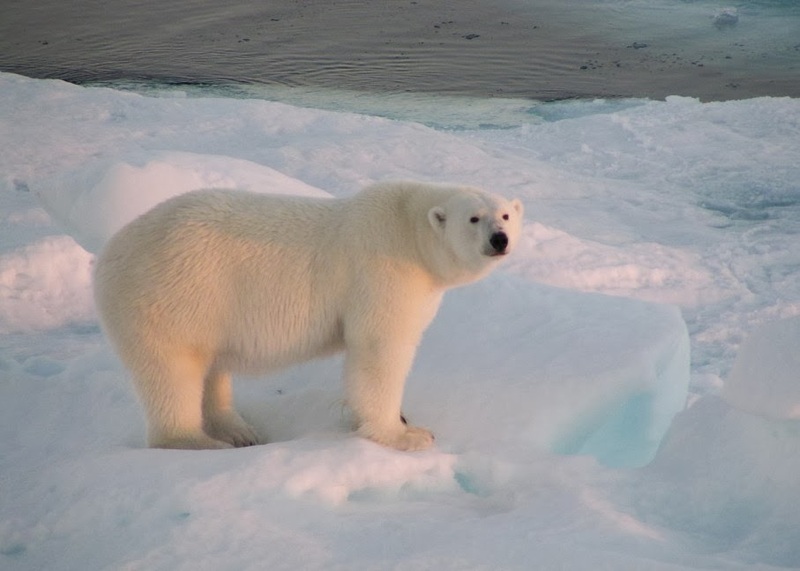 There is no substitute to take over when the Top Dog of the food chain disappears, and as people hunt all of these species to near extinction, we see a wave of changes that result. It is called a trophic cascade, the trickle-down interactions between a predator, its prey, and the animals and plants even farther down the food chain. Maintaining prey populations allows plants and smaller animals to flourish too. Wolves, tigers, and eagles all use large areas to find enough prey, but their presence in sufficient numbers is important for maintaining the quality and equilibrium of the whole system. Not sure if that is a thumbs-up or down, but thank you for visiting the site! So you're keen on hunting however you've never done it and you don't know where to begin. Well for one thing "Welcome" and unwind it is not as overwhelming as you may think. This article is going to lay out a portion of the rudiments and make it simple and fun. The post deals with native animals hunting their prey. While I am not at all keen on hunting, it's important that top predators can play that role in their natural environment. Cheers! Thanks for giving us such a nice picture and overview of Yellowstone National Park situated in US and it is famous as the world's first national park that conserves one of the world's few intact temperate zone ecosystems. Every animal looks so healthy and pretty awesome. Thanks for share the article. 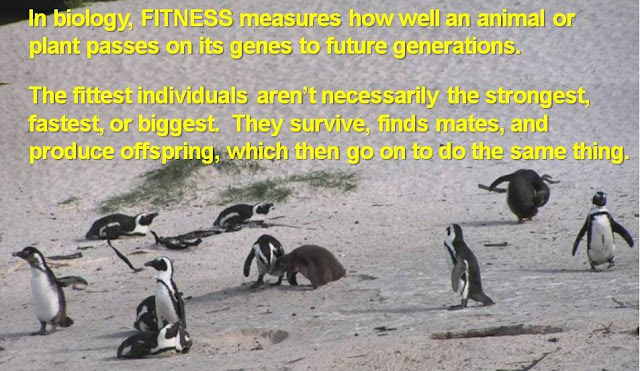 Thanks for your comment - it is an important ecosystem, and the top predators help keep it that way. Visit if you can! Nice post! Will be visiting your blog again! Hi, this post is very informational. Every animal looks so healthy...Nice Picture. Thanks!